You are currently browsing the tag archive for the ‘hair-style’ tag. Today I dyed my own hair. All by myself. Going to the hair salon can be a very time-consuming, expensive task. I’ve only gone to the hair salon to get my hair dyed twice in my life (I’ve been dying my hair for quite a few years). Both times were horrible experiences/money wasters. Ever since then, I’ve been dyeing my own hair at home. I’ve tried various brands (Loreal’s Feria, Garnier Nutrisse, etc. ), but my favorites are two Japanese brands that I’ve found to work best on my hair: Dariya’s Palty & Mandom’s Lucido-L. Here, I’ve chronicled my hair dyeing experience. * Lúcido-L is my favorite take-home hair coloring brand. * So far, it gives the best overall even coverage, & the end result actually matches the color swatch on the box. * The items needed for the 2-step easy process. * Add the coloring to the dye mix & shake the bottle thoroughly for approx. 1-2 minutes. * Apply the dye evenly & let it sit for approx. 1 hour. Of course, you know the rest…rinse thoroughly until water runs clear. 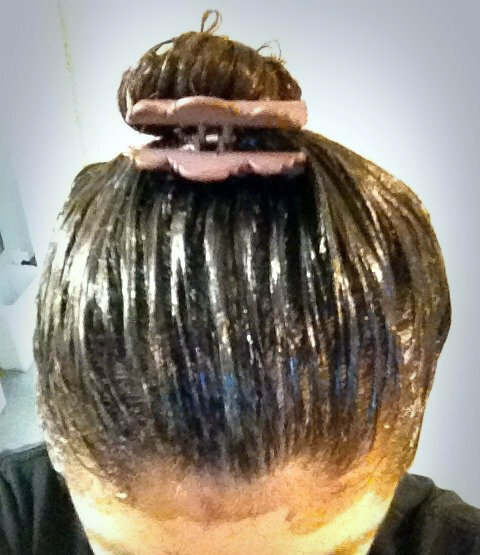 After rinsing out the excess dye, apply the nourishing hair mask (pink pouch) & rinse (like it’s a conditioner). I go one step further by washing my hair with shampoo & conditioner after I dye my hair…just to make sure my hair is washed clean. * This time, I took the extra step of using this hair repair mask (Graham Webb Silk Repair Advanced Therapy Treatment). I received this hair repair packet from a friend who recently got married. She gave me this as part of a gift set for being a bridesmaid in her wedding. I wanted to try this hair mask & thought this would be the perfect opportunity to try it. My review: Eh~ It’s not bad, but in the end, it’s not my cup of tea. * This is the end result… I’ll try to post a “before” picture to show you what my root color looks like. It’s not a dramatic change, but I really wanted to hide my roots while freshening up my hair color in a sort of subtle way. Cheers!